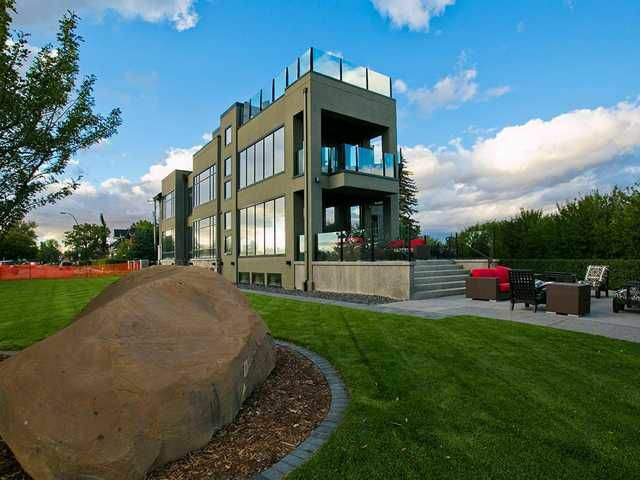 IMMEDIATE POSSESSION AVAILABLE - Stunning downtown, river valley & mountain views from this magnificent contemporary residence perched on an exclusive point on the ridge steps north of downtown. Near 10,000 sq ft of luxurious living space designed for entertaining and features a massive foyer with Guggenheim inspired glass dome ceiling, gourmet kitchen with sitting library, formal dining, and living room with uninterrupted views. Four luxurious spacious bedrooms with individual themes and en suites occupy the second level with the masterful conservatory. The master retreat boasts a spectacular view, double sided fireplace, spa like en suite, privacy deck and private access to the rooftop deck with 360 views and hot tub. Third level library/den. The lower level offers a media room, 2 bedrooms, professional workout room, family room and quaint bar. Total home automation, endless custom millwork, triple door garage that accommodates an RV and lifts all on over 1/2 acre with ample yard for swimming pool.